A MESSAGE TO NEW FOLKS: We strongly encourage everyone new to our temple or to meditation to participate in an orientation to our temple style and meditation at our Sunday morning 8:45 am Meditation Instruction. If Sundays do not work for you, please send a request to info@ancientdragon.org for a personal arrangement for meditation instruction and orientation. Everyone is welcome, regardless of prior experience in meditation, and no preregistration is required. 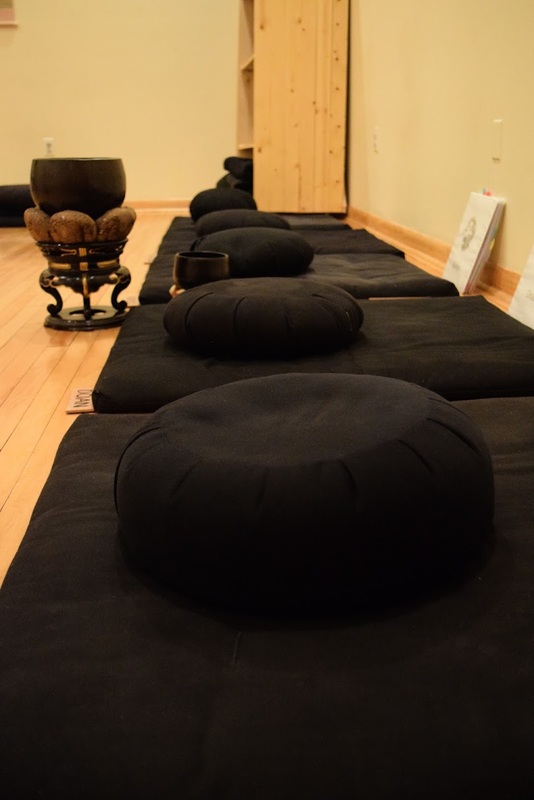 We have plenty of chairs, meditation benches and floor cushions to support your preferred seated meditation posture. Although our regular weekly events are free and open to the public, we gratefully invite donations to support our offerings. Here are descriptions of our weekly-recurring practice offerings at our temple at 1922 W Irving Park Road. Sunday mornings begin with meditation instruction at 8:45 am (*) for people without prior Buddhist meditation experience or for those who wish to become familiar with our temple style of practice. At 9:30 am, we offer a thirty-five minute period of zen meditation (zazen) and 10 minutes of walking meditation (kinhin) that is followed by a Dharma talk and discussion at 10:15 am. The 9:30 am Zen meditation and 10:15 am Dharma talk are always open to the public, even when there is a special meditation event. After the dharma and discussion, there is the option to participate in a brief period of temple cleaning (soji) followed by informal tea and socializing. * Please note that there will be no meditation instruction, temple cleaning or tea on Sundays when we have special sittings. Consult the calendar for details. Our Meditation and Recovery program occurs every Tuesday, 7:15 – 8:30 pm. This weekly meeting features sitting meditation followed by discussion to support those in recovery from addictive substances and behavior patterns. For information contact Michael Soter via info@ancientdragon.org. Everyone is Welcome, regardless of prior experience in meditation. No pre-registration required and any donation will be accepted. Wednesday mornings we begin the day with Zen meditation at 7 am, followed by an optional short service with chanting. We offer one forty minute period of zen meditation followed by 10 minutes of walking meditation (Kinhin). Reading and discussion of Zen Mind, Beginner’s Mind by Shunryu Suzuki Roshi. This group meets most Wednesday afternoons* in Rockefeller Chapel in the heart of the University of Chicago campus.